As we all know, there is an abundance of feral animals on Tantalus– from wild pigs to chickens, rabbits, Jackson Chameleons, birds, dogs and cats. Many neighbors have helped with this problem, but a few have done an exceptional job and a real community service. Our volunteers follow the Humane Society’s plan to trap, neuter, return and manage (TNRM) to compassionately reduce the number of strays over time. Some have commented that they don’t see kittens on Round Top anymore. That’s due to continuous trapping and sterilizing. The numbers are stabilizing and diminishing. This is a community problem, and these efforts are particularly important now. 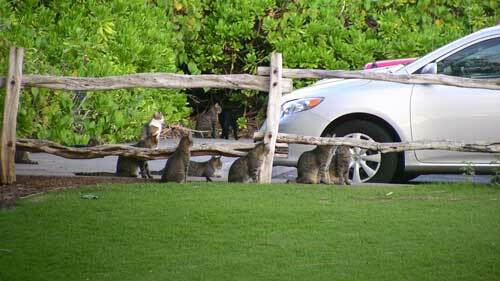 Due to lack of funding the Hawaiian Humane Society will no longer be picking up strays unless it is an emergency. We have formed a Feral Animal Committee and would love to have animal lovers join our on-going efforts to humanely control feral animals on the mountain. It would be terrific if other Tantalus residents would pitch in. Be part of the solution. We need your help! There are many ways to volunteer. E-mail vdurand (at) hawaii.rr.com or kolekolea (at) gmail.com if you can help.